When planting for all seasons, there is no doubt that spring and summer have the advantages because so many plants produce amazing blooms at these times. For fall and winter gardens, we sometimes have to look for interest besides blooms. Colorful fall foliage, deep evergreen foliage, and brightly colored berries draw the eye to the autumn and fall garden in place of blooms. One such plant that can add splashes of color to the fall and winter garden is American Revolution bittersweet vine (Celastrus scandens ‘Bailumn’), more commonly referred to as Autumn Revolution. Click on this article for Autumn Revolution bittersweet info, as well as helpful tips on growing Autumn Revolution bittersweet. American bittersweet is a native vine in the U.S. that is known for its bright orange/red berries which attract an array of birds to the garden. 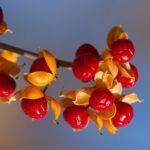 It is important to note that while these berries are an important food source in autumn and winter for our feathered friends, they are toxic to humans. Unlike its non-native cousin, oriental bittersweet (Celastrus orbiculatus), American bittersweet is not considered an invasive species. In 2009, Bailey Nurseries introduced the American bittersweet cultivar ‘Autumn Revolution.’ This American Revolution bittersweet vine cultivar boasts having large, bright orange berries which are twice the size of other bittersweet berries. As the orange berries ripen, they split open to reveal fleshy, bright red seeds. Like other American bittersweet vines, Autumn Revolution bittersweet has deep glossy green foliage in spring and summer that turns a bright yellow in fall. The most amazing attribute of Autumn Revolution bittersweet, however, is that unlike the common dioecious bittersweet vines, this bittersweet is monoecious. Most bittersweet vines have female flowers on one plant and require another bittersweet with male flowers nearby for cross pollination to produce berries. Autumn Revolution bittersweet produces perfect flowers, with both male and female sexual organs, so only one plant is required to produce an abundance of colorful fall fruit. A very low maintenance plant, not much American Autumn Revolution care is required. Bittersweet vines are hardy in zones 2-8 and are not particular about soil type or pH. They are salt and pollution tolerant and will grow well whether the soil is on the drier side or moist. Autumn Revolution bittersweet vines should be given a strong support of a trellis, fence or wall to attain their 15-25 foot (4.5 to 7.6 m.) height. However, they can girdle and kill living trees if allowed to grow upon them. American bittersweet vines require no fertilization. They can, however, become sparse and leggy near their base, so when growing Autumn Revolution bittersweet, it is recommended that the vines be grown with full, low growing companion plants.